After murdering his wife, a businessman on the verge of bankruptcy, Hwang Kyung-min, finds an old classmate, Jung Jong-suk whom he hasn't seen for fifteen years. During a reunion dinner they look back on their school days, hiding their present situations. Back then there were class distinctions among the pupils. The elite students – 'The Dogs' – rich, successful and particularly cruel, exercised a reign of terror over the weaker, poorer students - 'The Pigs'. Jong-suk and Kyung-min were powerless against the 'dogs’. When Kim Chul, one of their fellow pigs, stood up, he fast became their last hope to end the circle of fear. Fifteen years later, Chul remains a hero. But behind his figure, the two men recall the murky story of their bond and return to the site where the most shocking truth of what happened there is finally revealed. 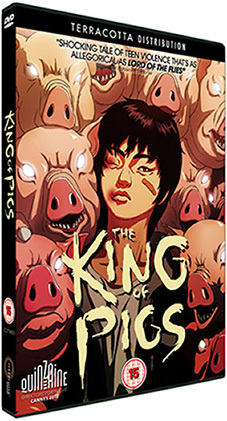 The King of Pigs (Dwae-ji-ui wang) is an ultra-violent Korean animation from director Yeun Sang-ho and starring the voices of familiar Korean actors, Yang Ik-june and Kim Kkobbi from the internationally acclaimed Breathless, released by Terracotta Distribution in 2009. A festival favourite, this feature animation (aka Manwha) premiered at the 2011 Busan International Film Festival and has since played in various international festivals including the Director’s Fortnight 2012 making it the first animated Korean film to screen at the Festival de Cannes. The King of Pigs will be released theatrically in the UK on 25th January 2013 by Terracotta Distribution, with a DVD release following in March, full details of which will follow later. For now, here's the trailer.